What a week. And to think, it’s only Monday (EST). Few quick things to hit on before we launch head first into Great Jedi War XII. I wanted to quickly shoutout to the members that have received merit awards for work done for the Voice of the Brotherhood. I appreciate these members of both my staff or as contributors, and always look to make sure those that step up and help out get recognition. Dark Cross to Kul’tak Drol for project work. Dark Cross to Selika Roh di Plagia for project work on Arx. Anteian Cross to Atra Ventus for his project work on Arx. Anteian Cross to Braecen Kaeth for work as Magistrate. Steel Cross to Atyiru for work as my Praetor. Steel Cross to Korroth for his stellar project work for the Voice. Just wanted to remind everyone that per my last report, there have been a few changes to how things are done for the Character Sheets. Please read the report for more information. Beyond that, I also announced that Snapshots based on your Possessions Loadouts will be required for the Great Jedi War fiction prompts. If you have any questions on this, please feel free to ask, but there is some great information in the report. We’ve launched a new Wikipedia article simply called Fiction. From this article, we then crafted an auto-grading, reading comprehension based exam to help get you familiar with the documentation. We call it the Fiction Studies exam, and it is similar to the Run-On Studies exam we published the other month. This exam and documentation aims to teach members how to not just run and organize a fiction competition, but how to subscribe and submit to them as well. This course is meant to serve as a primer, not a guide on writing. See the Writing Department for more exams that we currently offer. Give the exam a crack here. As usual, if you have any feedback on the exam or the wiki article contents, please let us know. If you spot a bug, make sure to report it to the Shadow Academy team. I’d like to thank the entire team for their contributions on this project. Laren/Farrin really helped put a cap on this by getting it coded and implemented into the Shadow Academy. My team couldn’t have done it without them, and I look forward to continuing the Writing Department revamps post war. Props again to Korroth for taking lead on the project and sticking with it while I was all over the place with war prep. 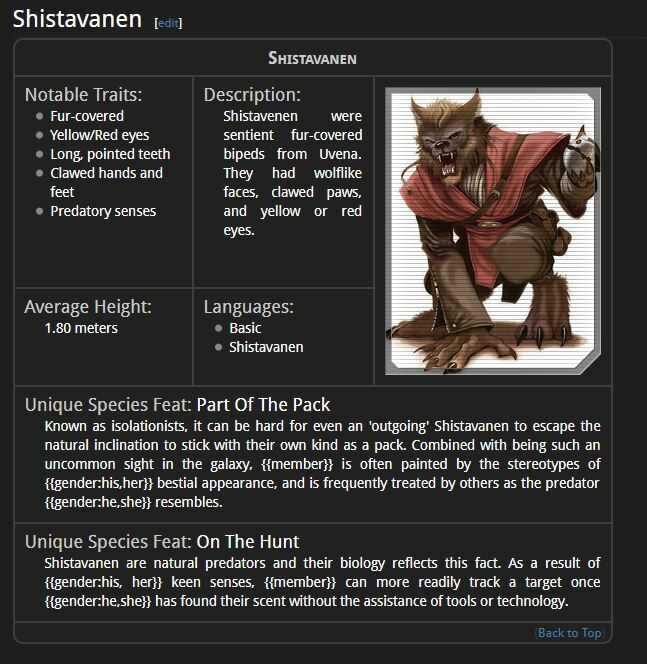 Shistavanen were submitted with a great proposal, and was supported by three members looking to actively play the species as a main and alternative character. This was actually the second time Shistavanen were requested, so it seemed like the demand was indeed there. I was able to pull some interesting species data I want to share with everyone, but it might need to wait until after the war. I'm sorry to everyone that is waiting, but I promise this will be at the top of my list to tackle post war. For anyone that missed it, the latest trailer for Episode VIII: The Last Jedi has been dropped. While I personally don’t view it as spoilers, I will throw up the caution flag to anyone that wants to go in completely blind. The Last Jedi hits theaters December 15th, 2017. On a personal level, I’m a big fan of director Rian Johnson and very excited to see this movie. Here are some important announcements relating to GJWXII. No other way to say it. War is almost upon us. Keep glued to the news page for more updates. For now, make sure you check out Chapter 1: The Collective, and the Wikipedia article that begins to cover our understanding of this new enemy. Good update, plenty of useful information. Sweeeeet! Happy to see the wolfmen in the DB! Yay wolf dudes! :) Great Fiction Course. I am so excited for this new writing course!! !